I love red peppers, especially when they’re roasted. As the colour becomes a deep, gorgeous and enticing red, the flavor becomes rich, and slightly sweet. Roasted red peppers make for great appetizers, pasta sauces and my most favourite of all – dips. 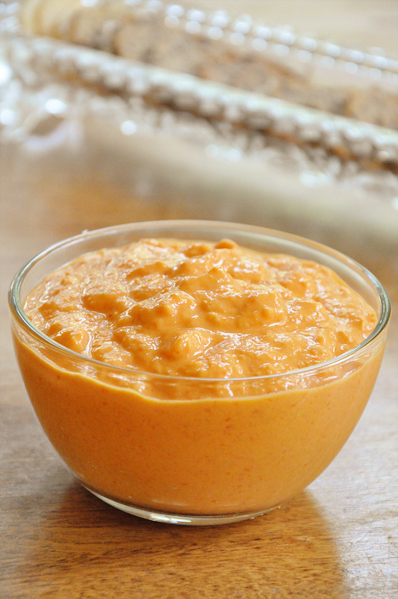 For about four years now, along with hummus, roasted red pepper dip has been my absolute favourite dip. I know that a lot of people are often searching for healthy snacks, because well, I’m one of them and from one healthy-snack-searcher to another, this dip makes for a great, healthy snack, pairing well with crackers or vegetables, my favourites are celery, broccoli or sugar snap peas. If you have roasted red peppers on hand (either the jarred variety or homemade) this dip takes a few minutes to whip up and can be eaten right away. I like to pack mine and bring it to school for lunch, or like yesterday, munch on some veggies and dip whilst I spend the majority of the afternoon vegging out in front of the TV watching All About Eve. Have you ever seen All About Eve? It’s a stellar movie that’s extremely entertaining and all I can say is that Bette Davis and Anne Baxter both give performances of a lifetime. Such a shame neither of them won an Oscar. As for tonight, I still have some dip left so I’ll eat it while I watch the season 6 premiere of Keeping Up with the Kardashians. Also known as, the polar opposite of the cinematic beauty and genius that is All About Eve. Combine all ingredients in a food processor. Pulse until ingredients are combined and dip is your desired consistency. Well, I’m off to get some studying done. Finals are killing me. Oh, yum. I love roasted red peppers! I had something similar to this at a restaurant, but it was so spicy hardly anyone could eat it. I'm bookmarking this! Awesome dip, it's healthy, looks delicious and sounds easy to make, a must try I think! =) Thanks for sharing! Oh that sounds very good!